Improved understanding of the removal and fate of trace organics during conventional (primary and secondary) municipal sewage treatment, as well as a wide range of advanced treatment processes such membrane-based treatment, advanced oxidation, and advanced biological treatment processes will enable improved treatment of chemical contaminants as well as the beneficial reuse of municipal wastewaters for water reuse and recycling. 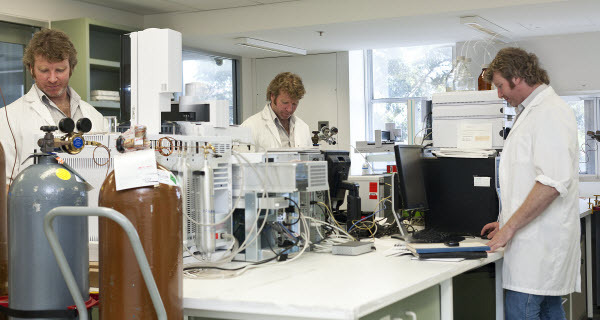 The trace organics program incorporates analytical determination, fate analysis, and removal characterisation of trace organic constituents such as pharmaceutically active compounds (PhACs), endocrine disrupting chemicals (EDCs), disinfection byproducts (DBPs), natural organic matter (NOM) and pesticides in water systems. Investigations of these chemicals are being undertaken for environmental waters, drinking waters, municipal wastewaters, industrial processing waters and biosolids using an array of analytical instruments. Examples include gas chromatography-mass spectrometry (GC-MS and GC-MS/MS), high performance liquid chromatography-mass spectrometry (HPLC-MS and HPLC-MS/MS), fluorescence excitation emission matrix (EEM) analysis and a multitude of UV-Vis Spectroscopy applications.